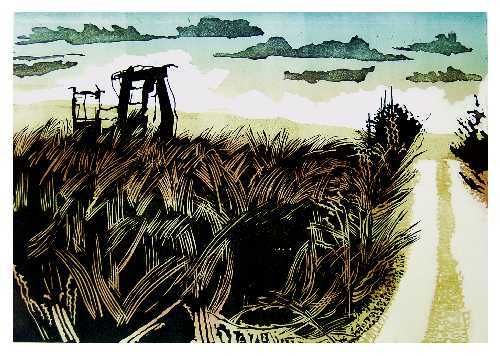 16" x 12" Multi-colour 2-block print on Somerset paper in an edition of 40 . This rusting digger lived on the lip , at 400ft ,of the drop down to the the Atlantic shore. As its form was eaten away by rust , it began to look more like a written Oriental character than a machine .The brightening light as we approach the sea always lifts the spirits .